This blog entry about the events of Tuesday, June 28, 2011 was originally posted on July 06, 2011. PART 11 (DAY 13): Perhaps the most popular thing Utah is known for (other than Mormons) is its different desert landscapes within its borders. In the southwest are the moonscapes of Capital Reef and Zion National Parks, along with the awe-inspiring Bryce Canyon. In the center lies the sand dunes of “Little Sahara.” In the northwest, there’s the bright white salt flats of Bonneville. Cheryl and I had already individually seen similar salt falts in Bolivia, and so we set our sights towards the southeastern part of the state, to the famed arched rock formations of Arches National Park. It’s where the most photographed arch of Utah lies, known as Delicate Arch, which is a rock formation so iconic that it’s on Utah’s license plates. “Or we could go to Vegas,” she said, noticing another option. We opted not to though, and eventually veered off the interstate to State Highway 6 towards Moab, UT, the popular outpost town for adrenaline seekers and nature lovers visiting Arches National Park and nearby Canyonlands National Park. I took the first driving shift while Cheryl took her usual nap, listening to a road tripping mix of 80s pop to country music. Along the way there were fields of wind turbines and rolling hills of green, which gradually turned into hardened hills of red rocks as if Mother Nature was tweaking the color hue of the landscape using a slider in Photoshop. Soon the foliage of the north was completely absent, leaving nothing but sand, dust, rock, and deserts shrubs on the other side of the windshield. “It’s lookin’ like deserts!” Cheryl proclaimed, awake. It was only a few hours to the Moab area, and we made a scenic detour from our scenic detour, stopping in Canyonlands National Park before Arches, to tour around its “Island In The Sky” — the northern section of the park most easily accessible to see things via car. The “Island” — a name given because it lies on an elevated mesa that really does feel like an island in the sky when you’re on it — is just one of three geologically distinct sections of the massive park, so big it’s easy to get lost for an extended period of time. In fact, Canyonlands is where Aron Ralston was trapped for 127 hours before James Franco played him in the Oscar-nominated adaptation of his true story. “I’m scared,” Cheryl said as we drove towards a gigawatt-powered lightning storm on approach to the park entrance. I assured her we were not in the environment suitable for a tornado to form. The park ranger at the gate told us the storm would pass and to wait in the visitors center before moving on; we were elevated after all, and a prime target for lightning bolts. The sky opened up as soon as we found a parking spot, and we ran to the building for cover. “[Man, and I’m wearing all white today too,]” Cheryl complained. Using Ranger Nathaniel’s advice, we drove around the scenic roads of the Island in the Sky, listening to Weezer and Guns ‘N Roses, stopping at different vista points to admire and capture the view on SD cards — although it was one of those environments where pictures definitely don’t do it any justice, even when using panorama mode. 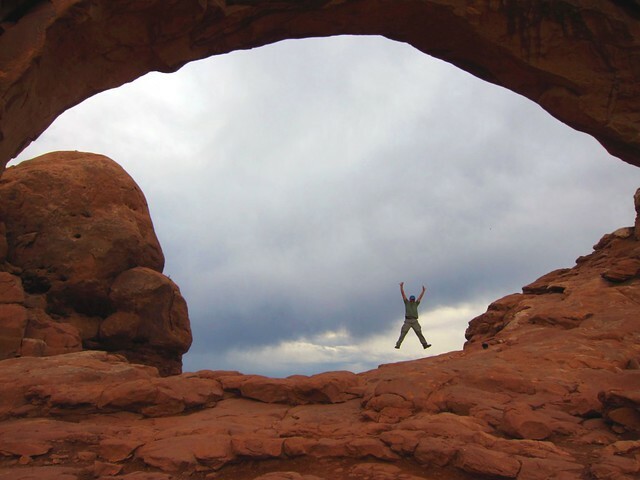 The most memorable sight of our jaunt in the Canyonlands was the view from Mesa Arch, which Cheryl already remembered because she realized it had been the picture of her Windows wallpaper for a while. (I remembered it from the movie Baraka.) It was a short hike from the lot to get there, only to see about two dozen other people obstructing the view. Fortunately, everyone was courteous enough to take turns with the arch, for photos or to simply marvel at the landscape on the other side. We had to be cautious of the updrafts, which blew some guy’s hat straight up off his head and into the air, plus it blew sand in our teeth when we smiled for photos. TO MAKE A HUNDREDS-OF-MILLIONS-OF-YEARS-LONG STORY SHORT, Utah’s arches were formed when two geological layers of rock and salt were on top of each other respectively, like a bagillion years ago. Over time, the bottom salt layer bulged upwards, pushing the rocky layers above into big exterior bumps, but then gradually eroded away. Additional erosion took place over hundreds of millions of years (give or take a million), leaving arch-shaped formations of rock. There are over 2000 arches in Arches National Park, but Cheryl and I would only see a handful of those during our time there. It was only about a half hour drive from the northern entrance to Canyonlands to Arches National Park, where we made our scene next. After a quick pitstop at the Visitors Center for some water and some pictures with die-cast sheep (not actually real), we drove up the hill to an environment suitable for a Road Runner/Wile E. Coyote cartoon (except during another passing storm). Before our first arches there were other impressive rock formations, like the “skyscrapers” of Park Avenue, the stupendous Balanced Rock, and ones that supposedly look like elephants if you have a vivid imagination or are perhaps a bit high. “It’s crazy,” I said, admiring what was before me. “It’s like we’re on Mars or something.” Cheryl was impressed, but was still concerned with her coming cold, plus her legs were still a bit sore from climbing in the Tetons. We had three introductory arches on our way: the Windows, north and south; and the Turret Arch, with its perfect vantage point of the two others. Underneath an arch, it’s easy to confirm that they are in fact completely connected to the ground beneath them. Needless to say, there were other people at each one, putting a damper on a solitary experience any (minus the occasional raven flying by), but I guess without the passing rainstorms it could have been worse. “It’s pretty rare you get an arch to yourself,” a fellow hiker said to me, noticing that one area had completely cleared out of tourists. Dusk was approaching and we decided not to do the 45-minute hike up to the actual Delicate Arch, but drive to the designated viewpoint for it farther away. I was hoping for a good sunset show, but when we walked up to the upper vantage point to see it, the arch was still pretty far away. I had to go beyond the end of the marked trail to get a better albeit mediocre picture of it. “If I don’t come back in 127 hours, you know where to find me,” I told Cheryl, who stayed behind. Sunset wasn’t too spectacular there, and it was too late to do the hike, so we settled on driving to Panorama Point for the show, although there wasn’t much of one with the cloud coverage. Plus a lightning storm started up again, which signaled us to give up and try again at sunrise; the sign at the Delicate Arch Viewpoint said photography was optimal in the morning anyway. That evening, we set up our tent at the KOA on the outskirts of Moab, a town more developed than I imagined, with dozens of motels, lodges, RV parks, fast food joints, sit-down restaurants, and outfitters for rafting, ATV riding, and most popularly, mountain biking. (KOA, Kampground Of America, is a national chain of amenity-filled campgrounds, with nice showers, clean bathrooms, and even WiFi connections.) It was pretty dark by the time we got there, so we just pitched the tent and drove to the Moab Brewery in town for dinner. (To save time, Cheryl inflated our sleeping mats with the compressor in the car.) The next morning, we were up early to try and catch the red hues of sunrise. IT WAS ALREADY BRIGHT by the time we departed the campground around seven, but I remembered from Torres del Paine that there’s sunrise over the horizon, and then sunrise over a mountain, which could be hours later. With that in mind, we still had time to get to the Delicate Arch for the red-lit sunrise show. However, the stop at the Red Rock Bakery and Cafe to pick up food took longer than anticipated, so I tried to make up time in the car. I was pretty determined to get to the Arch in time; if you’ve followed this blog, you know that I have gone through many lengths to photograph a sunrise, from trekking uphill in the dark — sometimes with a bum knee (and getting lost in the process) — to taking a pricey cab alone and hitchhiking in the back of a pick-up truck. We can make it, I thought. There’s nothing holding us back but time; I’ve done worse to get to a sunrise vantage point. Every second counts now; all we have to do is drive fast. “I pulled you over because you were driving too close,” the officer informed me. “You’re supposed to be two seconds behind.” I actually didn’t realize my violation — that’s how we drive in New York City — but he took my license and Cheryl’s insurance and registration to his vehicle. The Utah officer came back and let me off with a written warning and let us go, which was a good thing, even if it ate up a lot of sunrise racing time. “WHAT THE HELL,” I said reading the sign at the trailhead for the path to Delicate Arch. “[The sign yesterday said mornings were better. ]” The sign at this site declared photography was optimal in the afternoon, but we’d make the best of it that morning. This is just an arch, I had to remind myself. This isn’t the Ark of the Covenant. The “strenous” hike uphill wasn’t too bad (“strenous” was perhaps the adjective everyone used to warn people out of shape); it was still morning after all and not too hot, although it was definitely getting up there around 8:30. Cheryl and I hiked up and up amidst the desert lizards, following the piles of rock as trail markers, until we crossed the narrow pathway that led right to the famed arch. Despite our mild tardiness, we had still arrived early enough for the red light spectrum effects of morning, for good contrast and long shadows. It was also early enough that there were only about a dozen people there, an amount small enough that people could still take turns with the Delicate Arch, for photos and overlooks, rather than it be the mob scene that it usually is. And as Ranger Nathaniel had predicted, it definitely wasn’t ugly. “I’m so happy about the weather,” Cheryl said amidst the cool breeze. We’d lucked out; on a day with predicted scattered thunderstorms, we spent our entire time there during a lull. It was the perfect place for a breather, to take a break for some Words With Friends (yes, there’s wireless service up there), and some arch-inspired yoga poses. The crowds started to develop by the time we left. We hiked back down the hill and drove to the northern part of Arches NP to check out a few more of the 2000. Beyond Fiery Furnace (hiking permit required), we drove to the Devil’s Garden trailhead of the notable Landscape Arch and other lesser rock formations, as storm clouds began to develop. “I think Delicate’s the best one,” I told Cheryl, finally content and fulfilled with what we’d seen in Arches in a short period of time — even if it did entail hiking and some police involvement. “They make you work for it,” she replied. This blog post is one of sixteen travel dispatches from the trip blog, "The Global Trip: From Sea to Shining Sea," which chronicled a two-and-a-half-week road trip across the U.S.A., from New York to San Francisco, visiting several American national parks and monuments along the way.